Hyundai India launched the i20 Active some months back to rival the likes of the Toyota Etios Cross, Volkswagen Cross Polo, and the Fiat Avventura. However, from the looks of it, Hyundai’s new product offensive in the swiftly growing pseudo-crossover segment is far from over and the popular South Korean car maker could soon launch a more rugged looking version of the latest generation i10 in the Indonesian car market. 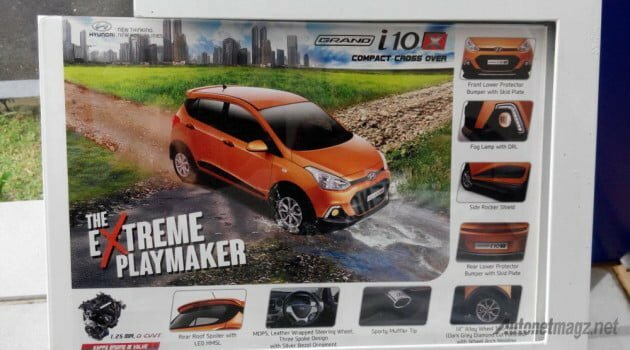 To be called as the Hyundai Grand i10X, the soon-to-be-released model could be the same Hyundai Grand i10 based SUV that is said to be headed to our shores. The new Hyundai Grand i10X (to be pronounced Grand i10 Cross) will be unveiled in Indonesia later today. The styling revisions that the i10 has received for the i10X are similar to the one found on the i20 Active. 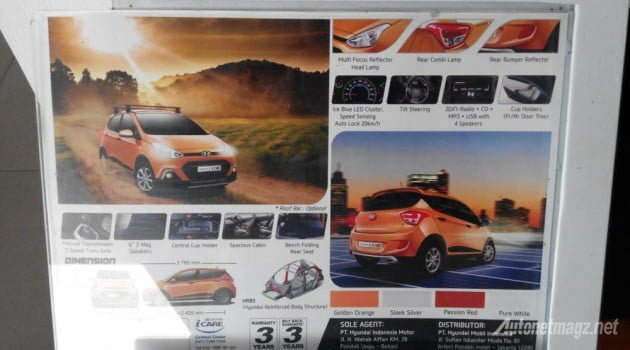 This means that the Hyundai Grand i10X gets a ‘adventure-styled’ body kit, a more rugged front bumper, new fog lamps, and LED DRLs. Additionally, the car also gets a roof spoiler, a chrome-finished muffler tip, and two-tone 14-inch mag wheels. With this, Hyundai is about to become the only car manufacturer in Indonesia to have a crossover-styled hatchback in its product line-up. On the inside, the car gets a leather-covered steering wheel and faux silver accents. Engine options for the i10X are being carried over from the Indonesia-spec Grand i10. This means that the upcoming model will go on sale with a 1.25 liter D-CVVT petrol unit that has a maximum power of 87 PS and a peak torque of 12.2 kgm. As we said, the Grand i10X could be the same Hyundai Grand i10 based SUV that is speculated to come to our shores. While official word on this subject is unavailable, you may safely stay tuned to Car Blog India for more dope on the Hyundai Grand i10 based SUV.